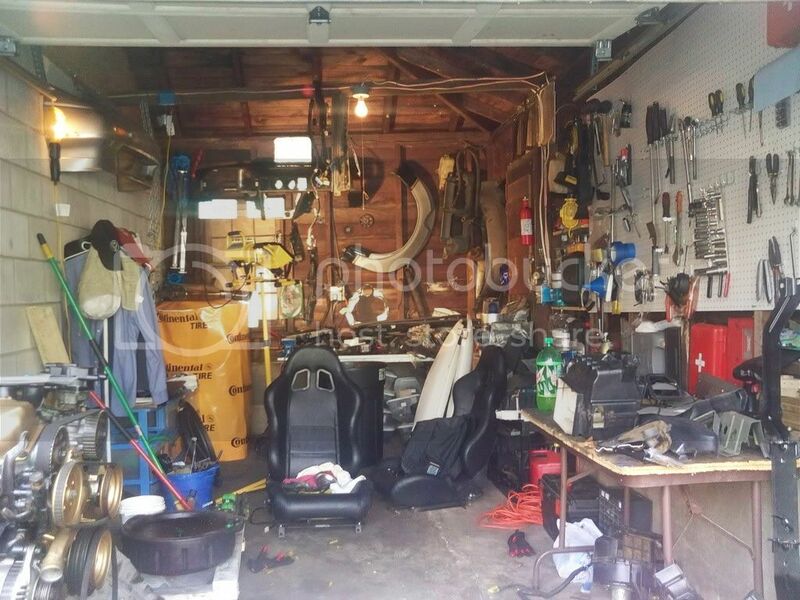 I've wanted to start a "garage" thread for awhile now and where better to start than with these photos that Gary Tylinski sent of his garage. What does your garage look like? Post photos here! Last edited by Ross.Williams on Fri Oct 02, 2009 7:57 am, edited 3 times in total. Wow - great stuff Carl! These Z's live better than some people I know! Keith - yours is nice too! My car wont fit until the interior and running gear is reinstalled. Back to reality... When I built my garage, I thought I'd never need anything bigger. 42x24 with two 18' garage doors in front and a standard 16' in the rear. Today I really wish I had made it at least 32' deep instead of the 24'. I bought another lot next to my house about 15 years ago - with the intention of building a larger garage... but several things happened over time and the last obstacle was a Zoning Battle... the lot is still empty.. Oh well, it turned out to be a good investment anyway.. The Thunderbird on the right is my wife's Super Coupe - it's a 91 with 9K original miles. I rent additional garage space about 2 miles South of the house. File comment: The Back Yard - where the shade is...The 16&quot; garage door in back allows me to drive though the garage - or get good cross ventilation in the summer. I added the 12'x30' pattio for some extra room..
Real nice stuff..........to die for. Its nice to see all that hardware all under one roof. Its almost as nice as the "Datsun Dream Garage" add from Nissan (attached pic) However ...............Its a bit unnerving also, I prefeer to spread out my Toys. I keep my first car(66 TR GT6 Mk1 see mem rides) in an enclosed car trailer in my trailer port. My two 510 racers are out back in car ports and my 510 Wagon is up front in the car port attached to the house. My garage is reserved for the two Zs and half of my parts inventory & shop. The 07 FJ TRD(Nissan didn't import the Patrol...yet) alas has to ruffit out doors as well as my F250 PU. I don't like keeping all my eggs in one basket. Would I trade my space for the Garage on the Lake.........You bet. At least I'm not ashamed to show my garage now. Of course It's still an ongoing process to achieve my garage goals. Since this pic. was taken, the 240 now sits on the right with smaller tires that match, and the 83 sits along side it. The 300 now sits outside with the cover on it. One of the goals is get some of those storage lifts so I may I have 4 cars in there. Hopefully the 370 could be # 4, if job security looks good. Or a Z32 would work as well. Or, both Then I need another garage. I put away my '70 240 and '87 300 for the winter today and thought I would take a couple of pictures to share MY Z garage on this thread. That's the '87 on the left, the '70 on the right and the '03 in the center. This is where the three of them rest for the winter. The '78 is already tucked away at my son's house. What you are seeing is the 3 car "half" of my garages, the other side of the wall is a 1.5 car space that I "let" my wife use in the winter months. In the summer the 350 lives there to give me more working room. The large side is my "Z Shop" complete with mechanic's pit, heat, hot/cold water washtub, cable TV and compressor. The stairs in back walk down to the pit and also enters the basement area where I store my TONS of Z parts. Last edited by ZCARNUT on Mon Oct 12, 2009 7:43 pm, edited 1 time in total. Better start planning on expanding the garage! Ooooohh, I'm not jealous or nothin'. Your garage is cleaner than my dentist's office. My god, some of your garages are bigger than our house!